Negroni served in a whimsical bottle, The Apo in Brisbane (photo: Alicia Taylor). Susan Gough Henly has a night of dazzling flavours in the confines of a remastered Victorian apothecary. I’m Brissie born and bred and when I left town the only bespoke things about The Valley were better left unsaid. But tucked along the Ann Street strip in the heart of Brisbane’s bar and clubbing capital is The Apo, a beacon of refinement in an 1862 two-storey Victorian Apothecaries Hall, a good old-fashioned pharmacy that used to sell ‘prescriptions and family recipes dispensed in strict accordance with the London Pharmacopeia’. Brisbane’s entertainment gurus, the Moubarak family, are behind the building’s new incarnation. The Apo has a airy dining area with exposed brickwork. They’ve already tantalised the city with their Middle-Eastern inflected Gerard’s Bistro on James Street, their eclectic Bar Laruche also in the Valley, the exotic Lychee Lounge in West End, the newish Defiant Duck and their three popular Hatch & Co eateries. These guys love mixing food, drinks, music and art into theatrical experiences. It’s never just about the food, but what comes out of the kitchen, especially at The Apo, are the sort of sit-up-and-pay attention morsels that will excite the most serious restaurant lover. A 1.5-metre cast-iron, copper, brass and silver cocktail shaker has pride of place in the shopfront window and a long bar and open kitchen extends along the left-hand side of the room. Original brick walls, polished concrete floors, rough-edged tan leather curtains, and a scattering of cobalt blue cushions on stools give a raw industrial feel to the historic space. Downstairs, the restaurant spills into a courtyard on Bakery Lane; upstairs is the bar with various nooks, including a room with squishy red leather couches. We start with Apothecary Bloody Marys. Bartender extraordinaire Pez Collier creates a sort of ketchup with porcini and wild mushrooms, herbs, lemon and seasoned tomato juice which he then bottles with unfiltered vodka. We’re served high ball glasses with the Bloody Mary mix in small medicine bottles for us to pour little by little. That way, our waiter tells us, the cocktail won’t dilute too quickly over ice in Brisbane’s humidity. Alongside is the perfect accompaniment, smoked almond-stuffed olives topped with tiny micro greens, to nibble as we peruse the menu. Wow! Chef Braden White (ex-Ricky’s Restaurant and River Bar, Noosa) has created dishes that are clearly meant for sharing and two-thirds of the entries are small plates, with prices to match. We start with sand crab and finger lime wrapped in blanched silver beet and dotted with nasturtium leaves. They’re sweet, clean-tasting and delicious… sort of like an Aussie sushi roll. A buttery brioche roll with chunky lobster meat in a chive-dotted mayo is better than any old-fashioned lobster roll I’ve tasted in Maine. Melt-in-your-mouth slow-cooked lamb breast with petite onions and a tangy chimichurri sauce goes down a treat with sprouted beans, legumes, chardonnay and pickled herbs, the tartness of the veggies breaking the umami richness of the lamb. And a burrata enveloped in thinly sliced, ruby red figs is the most fun you can have with your clothes on. A Spanish albarino white wine offers a perfect counterpoint to the carefully conceived dishes. The name ‘Apo’ says it all. 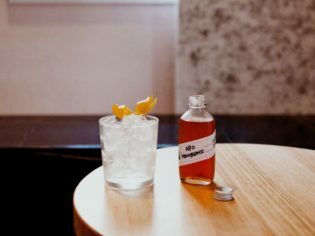 It’s both a nod to the building’s historical roots and a perfect moniker for what goes on here – a mixin’ and a matchin’ of weird and wonderful potions, both liquid and solid, to tantalise your tastebuds. Verdict: Come with an adventurous spirit and you’ll enjoy sampling the cocktails, the blend of ingredients which is as inspired as the food you’ll share. We rated: Both the food and cocktails were outstanding, with close attention to interesting flavours, textures and presentation. We’d change: There is a motley collection of chairs and stools. I’d get rid of the stools, which are a little uncomfortable if you are settling in for the entirety of an evening.